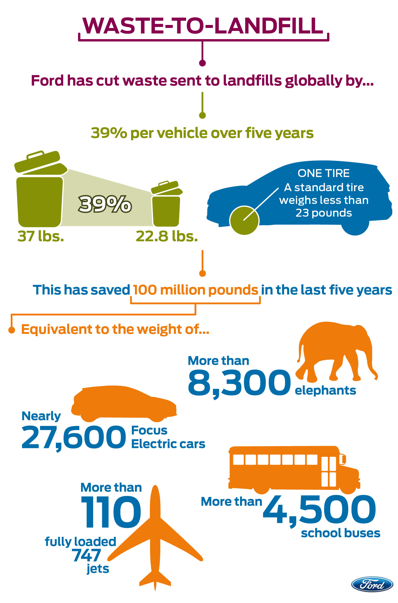 Recently Ford announced a new waste reduction goal of 10 percent by the end of year which, if successful, will cut waste per vehicle by about 20 pounds, or roughly the weight of one tire. This goal builds on existing, green efforts by Ford that have cut global waste by 100 million pounds, or 44 percent, over the last five years. Between 2007 and 2011, Ford globally cut the amount of waste it sends to landfills by 39 percent per vehicle – from 37 pounds to just under 23 pounds. In the United States (US), the amount of waste generated per vehicle has been cut even further – by 47 percent. 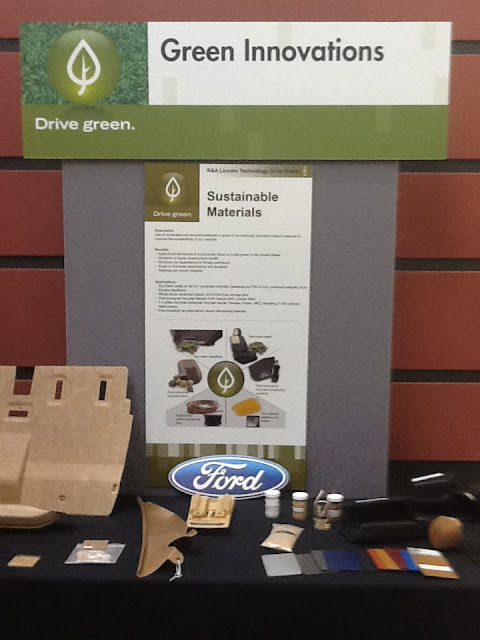 To meet the new 10% reduction goal for 2012, Ford is testing innovative technologies that generate energy from paint, use solar power to run waste compactors and they are launching initiatives to educate consumers on sustainability and testing sustainable materials for use in cars like shredded money. “Reducing waste to landfills is one of our top environmental priorities and we continue to challenge our teams to identify and implement innovative solutions,” said Andy Hobbs, director, Ford’s Environmental Quality Office. Ford develops such targets as part of its annual environmental business planning process that also recently led to establishment of a global cross-functional team spanning several divisions to review waste generation more holistically. One of the best examples of how Ford has reduced waste can be found at its plant in Flat Rock, Mich., where the automaker uses an innovative process to eliminate waste and transform paint solids into energy at the AutoAlliance International facility. Ford began a pilot program in 2011 with a local energy supplier at AutoAlliance, where paint solids – a material often sent to landfills – are sent to the energy supplier and used as a raw material in its process to generate electricity. The reprocessed paint solids are then dewatered to increase their energy value and sent to a local power plant. This is an innovative way to keep material out of the landfill and use it as a raw material in another process. The project is being replicated at several other Ford assembly plants. 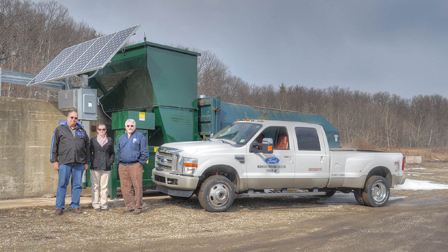 MPG and its waste management partner teamed up to take a fresh look at the operation and came up with a winning combination of recycling measures and new solar-powered technology that can provide the power required of trash-handling equipment. The new energy-efficient compactor, powered by solar panels, compresses the waste much more efficiently than the previous compactor. The compacted trash is then sent to a waste-to-energy facility where it is converted into power. This compaction reduces the number of shipments and thus the fuel consumed for its transportation. Coupled with previous efforts to recycle all of the site’s cardboard, paper, wood and plastic, this eliminates the need to dispose of any waste in a landfill. In December, Ford announced plans to reduce the amount of water it uses in the manufacture of each vehicle 30 percent by 2015, compared with the amount used per vehicle in 2009. And Ford has been working on developing numerous, new sustainable materials for possible use in its vehicles, including corn, sugar beets and cane, coconuts and even shredded money . I got a chance to meet with Ellen Lee, Plastics Research Tech Expert and Angela Harris, Plastics Research Engineer with Ford Motor Company's Sustainable Materials Lab when I was at Ford Headquarters in Dearborn, Michigan. Currently, nearly all Ford vehicles already utilize soyfoam technology and 75% of Ford vehicles have soyfoam headrests. Through using soy, Ford is able to reduce their petroleum usage by more than 5 million pounds each year. Ford has also recently announced that it is launching new initiatives that encourage consumers to take a more sustainable approach in life year-round with a national electrified vehicle education program, multi-city tour and the debut of a 10-film documentary series with SHFT.com, an award-winning sustainability lifestyle platform. There are many reasons my family has long been a fan of Ford vehicles. Their innovative green initiatives and commitment now top the list - along with their powerful yet eco-efficient engines, tight suspension and innovative design - of course! 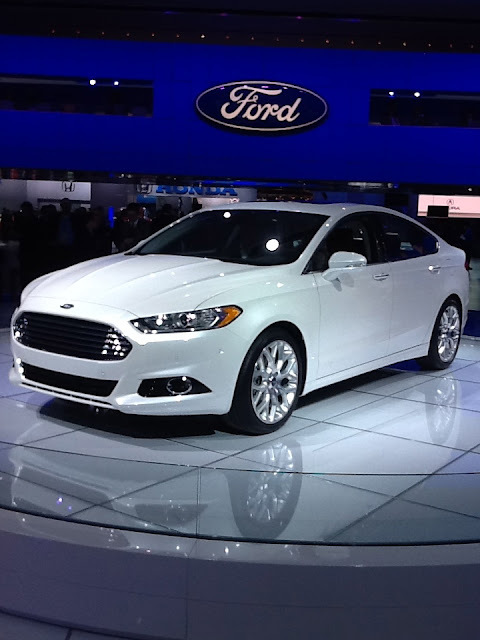 My sources tell me that consumers can expect more Ford and Lincoln models with cutting edge design and efficiencies just like the ground breaking, newly redesigned 2013 Ford Fusion Electric. This sedan was created for a global market and it shows. Ford continues innovating in ways that serve to help their consumer as well as our planet and they should be applauded and put firmly at the top of your list when looking for a new or used car.